The R/GA team was approached to create an influencer brand experience called Sneakerlab. The project utilized 5 artists/social media influencers to see how they could activate their following (via Instagram) to purchase footwear designed by them. Each designer designed 5 pairs of shoes and the products were available for 5 days only. Hence the name 5x5. 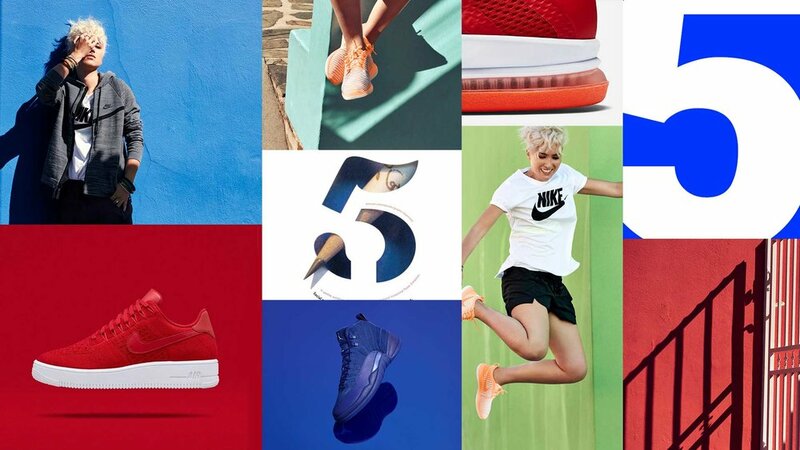 Our task was to create a rich and compelling site experience that showed the inspiration behind the shoe design at all touchpoints and excited consumers driving them to purchase during this limited time. The challenge and opportunity here was to create a new identity for this program since it was a new website powered by Squarespace. Understanding that the users of the site would be coming in from a visual heavy platform like Instagram, I wanted to make the visuals stunning, bright, bold, fresh and dynamic. Colorful and inspiring were words that I kept coming back to within my exploration. Without having to stick to the constraints of an existing typeface and defined guidelines we had the chance to create a new and unique typographic system. When creating the logo I wanted to emphasize the deconstructed nature of special craftsmanship behind the shoes. I did this subtly by breaking apart the number 5 in a few shapes. Conveying the inspiration behind each shoe was key so I designed lock-ups showing each shoe along with its reference image and color palette. Once the shoe designs were received the final assets were created. During it's 5 day run (1/6/17 to 1/11/17), the Sneakerlab campaign gained hundreds of thousands of impressions and generated a significant result in sales. The program was so successful that it continued for a second year and has evolved into a new program for the brand. The identity continues to live on.